Providing Harrisburg home care for an elderly loved one can be a difficult job, especially if he or she is living with a serious disease or illness. If you do not take a break and get outside assistance, you run the risk of jeopardizing your own health. 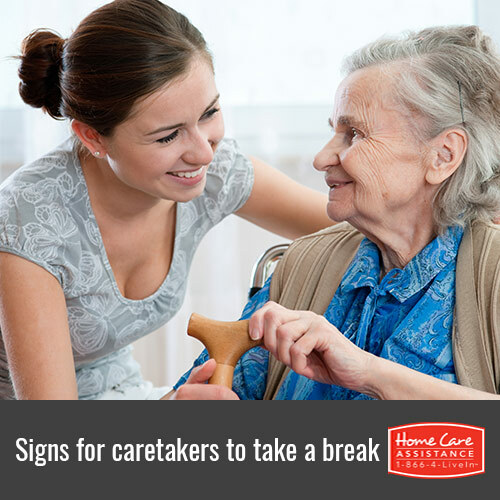 Here are some of the top warning signs it’s time to take a break from your caregiving duties. If you wake up tired, have trouble falling asleep, or can’t stay asleep, these may be signs of caregiver burnout. The amount of effort you put into being a caregiver may cause your stress levels to rise, leading to anxiety and depression and resulting in insomnia. However, if you create a bedtime schedule for your loved one and stick to it, it may be easier for you to get some rest as well. Social withdrawal often begins with missing an outing or two with friends and family, and then escalates to refusing socialization altogether. If you feel embarrassed about changes in your loved one’s behavior, you may stop going out in public or to family gatherings. To prevent social isolation, spend time with the people who bring you joy. Hiring Harrisburg respite home care allows you to leave your loved one with an experienced professional for short or long periods so you can attend social events. If you have gained or lost a few pounds while caring for your loved one, your body might be sending you a warning sign that you need help. Anxiety leads to weight loss and changes in eating habits, often lowering the appetite. As a caregiver you may experience emotions like stress, guilt, and regret, which can trigger emotional eating, frequent snacking, and other unhealthy eating habits that cause weight gain. Be sure to follow a nutritious diet and refrain from overeating. You can also visit caregiver support groups while taking a break from your responsibilities. Losing your cool easily is one of the most obvious signs you need to take a break from caregiving. You may become frustrated when met with certain caregiving challenges, regardless of how major or minor those situations are. If you begin to lose your temper with your loved one, or if you find yourself snapping at family members and friends, it is time to take a break. You can ask others to help out, or you can hire caregivers in Harrisburg to provide respite so you can go on vacation to get some much needed relaxation. After spending a few days or weeks away, you can return to your caregiving duties with a refreshed attitude. It’s only natural to want to make sure your loved one is cared for. However, other responsibilities in your life may make it difficult to provide the support he or she needs. If you need help caring for your loved one, turn to Home Care Assistance. In addition to respite care, we also offer 24-hour care and comprehensive care for seniors with dementia, Alzheimer’s, and Parkinson’s. Learn more about the high-quality in-home care services we provide by calling (717) 540-4663 today.